Here's my RNoAF (Royal Norwegian Airforce) Heuer flyback chronograph. One of my colleagues in his 50's came up to me one day at work and said he had found a old watch in a drawer that might be of interest for me.... He knew of my love for Heuer. And out of his pocket comes a Norwegian issued Heuer Bund. Do you want this old watch? He asked..... yes I did :-) He would not accept any money for it, but said ok to a symbolic sum after some persuasion. He got the watch when he was serving his time in the Norwegian Airforce as a photographer in the late 1970's. It was a gift from a friend that worked with supplies. He got it when they was phaseing some of them out. My friend was stationed at Rygge Air Base in the late 1970s. Based at Rygge was the 336 Squadron with their Northrop F-5 Freedom Fighters. The first F-5 arrived at Rygge in 1965 and stayed in active duty untill 2000 when the squadron was closed. My Heuer came from Rygge and was most likely worn by a F-5 pilot. The dial is the "T-only" with a tiny "T" appearing just above "6". There's five different versions of dials. The back is stamped LUFTFORSVARET and a number that ends with /76. This indicates that it was issued in 1976. The majority of these watches have the word “Bundeswehr” engraved on the back as they were issued to German servicemen from 1968 until the late 1970’s (Bundes Wehr means ‘Federal Defence’ in German). The calibre in my watch is the Valjoux cal. 230; a hand wound 17 jewel calibre with a rate of 18,000 bph. 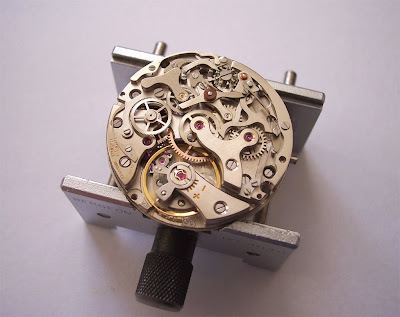 In a regular chronograph calibre the chronograph mechanism must be stopped before it can be reset. In a flyback chronograph, the mechanism can be reset while it is still running, making it particularly useful for timing consecutive short interval events. 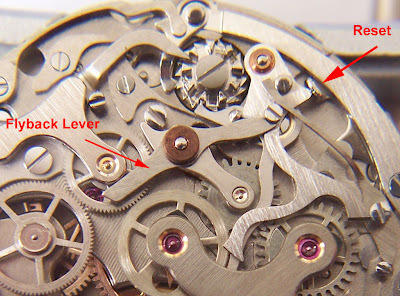 This is achieved by the addition of a additional lever in the chronograph mechanism. When the reset button is pressed the flyback lever lifts the coupling clutch from the chronograph centre wheel allowing the mechanism to reset. 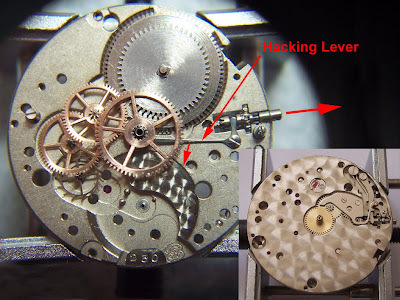 As well as having a flyback function this calibre also hacks, which means that the movement stops when setting the time so it can be set to exactly to the right second. This important on a military watch. 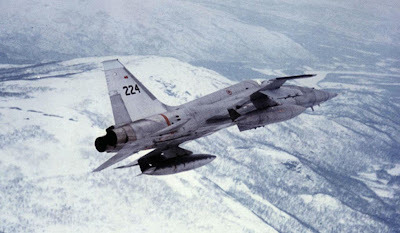 A Norwegian F-5 over the snowy mountains. 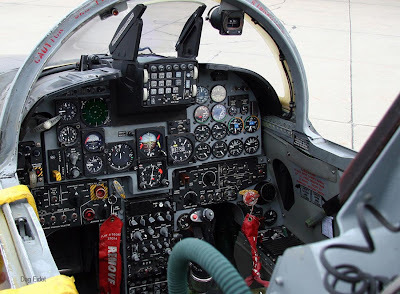 The workplace for a F-5 pilot. 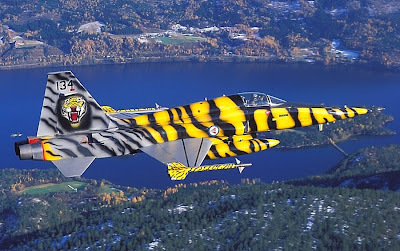 The famous "Tiger" F-5 from the Norwegian Airforce. Thanks to Richhard Askham of http://thewatchspotblog.com/ for his service of my Heuer and for the use of the pictures of the movement. 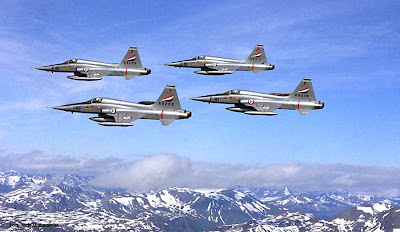 Jarl,excellent as always.The history of the F-5s in Norwegian service also serves as the perfect backdrop. Anders I will bring it on a NURK-meeting. 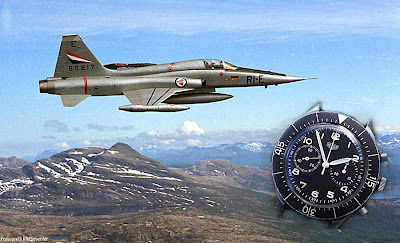 I have in my posession a Heuer 1550 SG (Luftforsvaret S/N 8904/73) that I used myself flying the F-5 and F-104 back in the 1970s. It is in good condition, and I might consider selling it, if the price is right?